The addition of new, fuel-efficient aircraft, modern passenger-focused mobile technology, and the introduction of a raft of new international and domestic routes all helped Russia’s S7 Group (the parent company to S7 Airlines and Globus) increase its 2017 traffic by 8.4% year-on-year to 14.25 million passengers. A total of 10.45 million were carried on domestic flights (up 8.3% on 2016); international traffic grew by 8.7% to nearly 3.8 million passengers. The group’s passenger turnover increased by 10.1% to 29.8 billion passenger-kilometers. Cargo turnover grew 10% to 2.8 billion ton-kilometers. S7 Airlines is headquartered in Novosibirsk Region and has offices in Moscow. In 2017, the carier added state-of-the-art, fuel-efficient Airbus aircraft to its fleet and opened several new domestic and international routes. The airline has a broad domestic route network with hubs at Moscow’s Domodedovo and Novosibirsk’s Tolmachevo. It also performs scheduled flights to CIS countries, Europe, the Middle East, Southeast Asia, and the Asia-Pacific region. 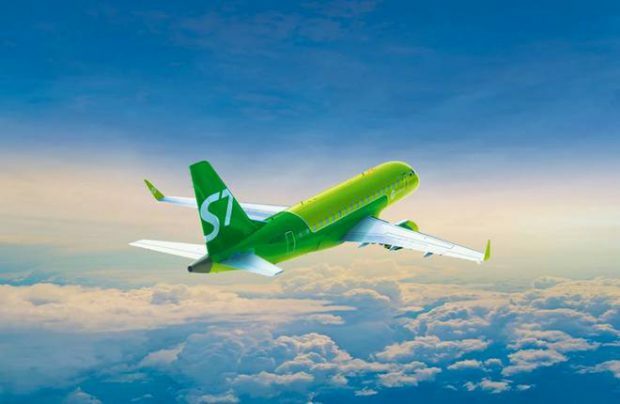 “S7 Airlines performed over 100,000 flights in 2017, an increase of 8.7 per cent [year-on-year], We consider this to be an excellent result,” enthuses Igor Veretennikov, commercial director of S7 Group. During the year S7 Airlines took delivery of four A320neos with their new-generation, powerful, high-efficiency engines. The new model cuts fuel consumption by up to 20%, depending on the route. The A320neos also offer longer flight ranges, a significant factor which allows the airline to introduce new long-haul destinations such as from Moscow to Tenerife, due to be available from April 2018. The operator also introduced 13 Embraer E170s, designed to carry 78 passengers in a single-class cabin. The addition of new international services to the existing S7 Airlines route network meant that, for the first time, passengers were able to take direct flights from Moscow to Vienna, Pisa, Rome, Catania, and the Greek island of Kos, as well as from Novosibirsk to Tbilisi and Karaganda and from Vladivostok to Osaka. During the year, S7 Airlines was constantly expanding the geography of its reach from St. Petersburg to such destinations as Western Europe, with the introduction of direct scheduled flights to Berlin, Innsbruck, Salzburg, Turin, Verona, and Lyon. The airline inaugurated more than 20 new scheduled domestic flights, including from Moscow to Petrozavodsk, Lipetsk and Bryansk; from St. Petersburg to Kaliningrad, Kaluga and Yaroslavl; from Novosibirsk to Omsk, Perm, Abakan, Gorno-Altaisk, and Chelyabinsk. In a memorable year for S7 Group, S7 Airlines and Alfa-Bank jointly introduced an innovative blockchain payments platform based on the Ethereum protocol, thus completing the world’s first ticket purchase transaction using an open blockchain API arrangement with the bank. Its implementation has opened opportunities for significant optimization of business processes, such as reducing the speed of settlements between the airline and its partners from 14 days to 23 seconds. Also last year, S7 Airlines – a member of the oneworld global aviation alliance – introduced new services that reduce the time passengers spend at the airport before departure, making the overall trip more comfortable. It means S7 Airlines is the first Russian airline to offer passengers the opportunity to check in their baggage online and then monitor its processing for departure using a mobile app. The introduction of the new technology also means airline employees can now check in passengers, add ancillary services, and print boarding passes using mobile devices. The service was pioneered at Domodedovo and Tolmachevo.